I love when the local bookstore asks me to interview a visiting author, making it a Q&A-style event instead of a reading. I like that better in my own events too, more of a conversation than a monologue. That unscripted quality is probably why the back-and-forth of questions at the end are often the best part of a reading. 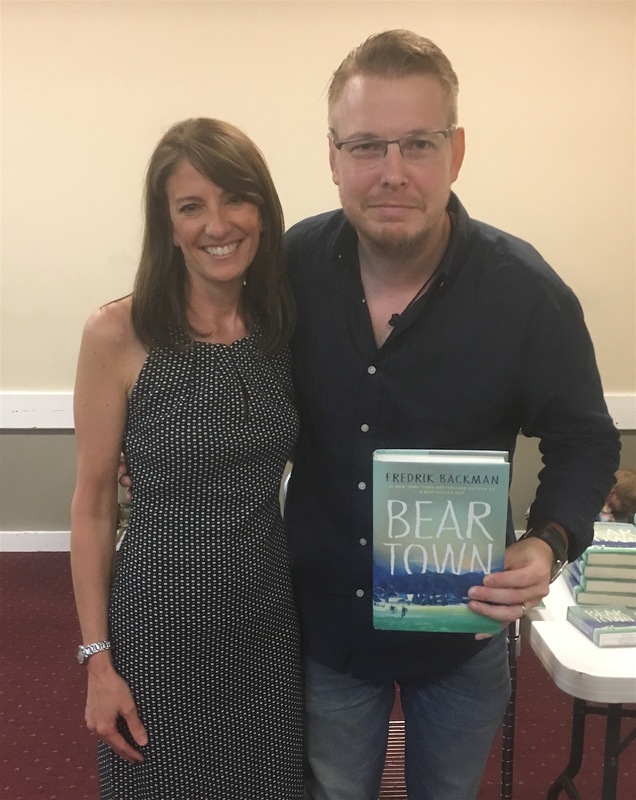 Yesterday bestselling Swedish author Fredrik Backman came to town, his only stop in the Boston area. I had three months’ notice to read his latest book, BEARTOWN, plus his backlist: A MAN CALLED OVE (once and for all settling any debate that existed over the pronunciation — it’s Ooo-veh), MY GRANDMOTHER ASKED ME TO TELL YOU SHE’S SORRY, BRITT MARIE WAS HERE, and others). Considering the number of people in this sold-out crowd lined up for selfies with the author, it looks like socially incompetent is the new black. This entry was posted in On Reading, On Writing and tagged A Man Called Ove, Beartown, Britt Marie Was Here, Fredrik Backman, My Grandmother Asked Me To Tell You She's Sorry, Swedish author, youth hockey. Bookmark the permalink.